What happens when you pair a mother’s wish to improve the eating habits of her family and community with a local food bank’s desire to offer nutritious produce in addition to the usual food staples? The result can be a unique partnership where children are sent home with fresh fruit and vegetables every week, and parents are taught how to prepare and serve them tastefully. In 2012, this wish became reality for Lisa Helfman when she teamed with Dr. Shreela Sharma at the Michael & Susan Dell Center for Healthy Living, University of Texas (UT) School of Public Health in Houston and the Houston Food Bank to develop the formula for Brighter Bites. The Brighter Bites Program goal is to help curb the childhood obesity epidemic with regular distribution of fresh produce and ongoing nutrition education for low-income, minority populations. Brighter Bites is now in five Neighborhood Center Head Start programs and 21 schools in the Houston area where 90% of the children qualify for free and/or reduced lunch. The program serves low-income families during the school year (eight weeks in the fall and eight weeks in the spring) and an additional eight weeks during the summer. Brighter Bites operates as a co-op, where the majority of the produce is donated by the Houston Food Bank. To qualify for the program, parents must commit to participating in nutrition education and volunteer for bagging and distributing the produce at their child’s school. Each week, children take home at least 50 servings of fresh produce. Brighter Bites served more than 1,700 families during the 2013-2014 school year and are currently serving more than 5,700 families in Houston and 1,800 in Dallas. According to Dr. Sharma, the program’s reach to Head Start has been another great accomplishment with more than 500 Head Start families participating. “The children are receiving about two servings of fruit and vegetables per day which equates to about 50 to 60 servings per week for a family of four,” said Dr. Sharma. “We are seeing close to 100% of families continue with the program throughout the 16 weeks the program is implemented.” In addition to receiving a variety of fruits and veggies each week, children are also taught about health and nutrition based on the Coordinated Approach to Children’s Health (CATCH) lessons. Parents are given a manual on providing nutritious meals, take part in cooking demonstrations, and receive recipes and food samples. Deanna Belleny, Nutrition Services manager at NCI Inc, says parents and children truly love the program and the excitement is felt throughout the centers on distribution day. Parent volunteers exchange recipe ideas with each other as they unload the produce each week. The kids excitedly peek into the bags to see what new items their parents are going to bring home. Teachers said the nutrition education lessons are fun, interactive, and perfect for their age group. Learn more about Brighter Bites and watch the video on how it all began. Also check out the webinar Brighter Bites: Helping Families Take CATCH Home. Kati Wagner, President of the Wildwood Child and Adult Care Food Program (CACFP), has teamed up with Let’s Move! Child Care (LMCC) to teach child care and early education providers in Centennial, Colorado simple ways to make healthier choices. Her team sponsors workshops, trainings and correspondence courses. MyPlate is the new “food pyramid” from the USDA. 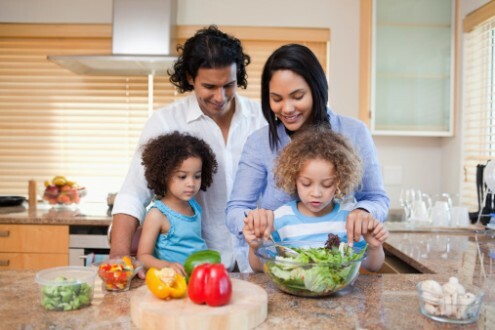 Learn how to build a healthy plate with vegetables, fruits, whole grains, lean proteins and fat-free or low-fat dairy at mealtimes.